Housewares company KitchenAid is celebrating 100 years of kitchen creativity by bringing some new color to your baking accessories. This spring and summer, the company is launching new KitchenAid ceramic bowls in beautiful colors and designs. Made to match your colorful stand mixer, the new KitchenAid ceramic bowls will come in five new designs: confetti sprinkle, parasol, Scandi floral, whispering floral, and white mermaid lace. Each design will be available in a five-quart size. In the press release, the company detailed how the new bowls will look, and how each bowl can mix and match with the variety of colors available for the bestselling KitchenAid stand mixer. Confetti Sprinkle sparks inspiration for your next baking experience with a burst of confetti. Parasol is inspired by worldly travels. This 3D-faceted bowl combines the traditional Japanese parasol umbrella with Scandinavian floral designs. Scandi Floral is a playful pattern with a hand-painted look that is inspired by Scandinavian floral designs. Whispering Floral is a subtle gray floral graphic applied to a white chocolate bowl, bringing forth feelings of peace and serenity to your kitchen. White Mermaid Lace is a 3D-embossed design inspired by a traditional Japanese fish scale pattern, finished with a reactive glaze that changes the color’s intensity to accentuate the pattern. Along with the new design aesthetics, the new bowls have a “variety of key product features,” including being microwave- (up to 475°F/250°C) and freezer-safe, and they’re lighter compared to previous models. They are titanium-reinforced to resist chipping, cracking, crazing, and staining, and are dishwasher-safe for easy cleanup. According to the company, the confetti sprinkle, Scandi floral, and whispering floral ceramic bowls will come with a manufacturer’s suggested retail price (MSRP) of $84.99. The parasol and white mermaid lace ceramic bowls will come with an MSRP of $94.99. Do you think you’ll be adding these new KitchenAid ceramic bowls to your kitchen? Be sure to SHARE these with all of your friends who love to experiment in the kitchen. We’ll update this once the bowls are on sale, so be sure to bookmark this page. To shop for current products that are available now, visit KitchenAid.com for more. Editor’s Note: Spine Media has an affiliate partnership with KitchenAid, and we may get a portion of revenue on purchases made through links on our site. 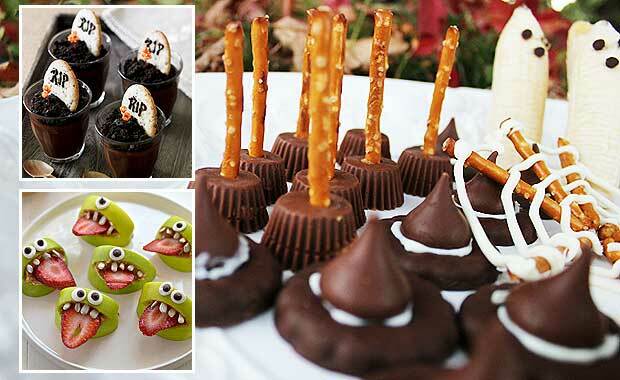 Whip Up These Delicious (And Sometimes Healthy) Halloween Treats!